Do you remember Ish Kabibble? Does the name evoke a fleeting touch of nostalgia? People not in on the secret could perhaps be forgiven for thinking that this is merely yet another Hare Krishna type wail. I must agree that it certainly looks like one. 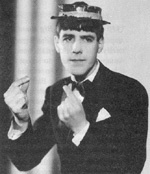 In fact, Ish Kabibble was the much celebrated trumpet player in Kay Kyser's Band, of The College of Musical Knowledge fame. Real name was Merwyn Bogue, but we all knew him as Ish. At one time the band seemed to be in almost every film that came out of Hollywood. 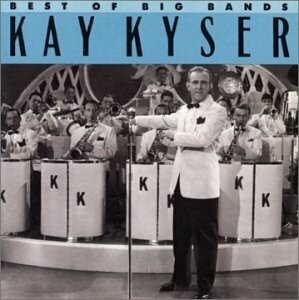 I can't remember whether Ish, or, indeed, Kyser's Band, were any good at all. It was a sort of Sid Millward and his Nitwits kind of band, and Ish was famous for one thing only, and that was his hair style. This was such that it was extremely difficult to make out whether you were looking at the front or the back of his head. It was like a brutal army haircut, put on the wrong way around. The result was that Ish looked somewhat like an Old English Sheepdog, but not half as pretty. We all loved him. Johnny Hawkesworth was so taken by Ish that he even bought an Ish Kabibble wig, don't ask me where from. He used to put it on at odd times and scare the wits out of innocent passersby. This was when we were in the Tommy Sampson band together. John was a very funny guy. He often exchanged messages with Cliff Dunn, another funny guy, who'd previously played guitar in the band. I remember him once getting a telegram from Cliff containing only the two words: Neckface. Neckface. One day in Edinburgh we were at a loose end, and so John put on the wig and we boarded a tram going up Leith Walk. The tram was crowded, with standing room only. Of course, as we pushed our way in, all conversation ceased. John, who had, together with the wig, adopted a most fearsome, imbecilic stare to match, immediately launched into a loud conversation with me in pseudo-Lithuanian, which went on until we got off the tram again. Everyone was so astounded that the conductor even forgot to ask for our fares. We got off the tram right in the middle of a cinema queue, and suddenly I found myself face to face with Nat Gonella. I had never met Nat before, but knew his face well from the picture in my Nat Gonella trumpet tutor. The only thing I remember about this tutor was that Nat said, right at the beginning, that no-one should attempt to copy his embouchure, because he played out of the side of his mouth. As this was an obvious attempt at preventing anyone from becoming a better player than he was, everyone at once began playing out of the side of his mouth with disastrous results. So here I was, confronted by my idol, who was one of the most celebrated trumpet players in Britain at the time. And right beside me was John, in his weird wig, and face to match. John recognised Nat at once, of course. To my utter horror, he proceeded to harangue him at the top of his voice, in his frightful Doublespeak, throwing his arms around wildly as he did so. Nat didn't know which way to look, trying to ignore us, and muttering Lay off, fellers out of the corner of his mouth. An interested crowd gathered. I thought we were bound to get arrested at any moment. Luckily for Nat, the queue suddenly began moving very rapidly, and he shuffled thankfully into the friendly darkness of the cinema. That was the only time I ever met him. It was also the last time I ever went out with John. Copyright ©2000 Jazz Professional. All Rights Reserved.